In the coming years, thousands of trucks with poor visibility will be banned from London’s streets to protect cyclists and pedestrians and a local advocacy groups wants Montreal to do the same. 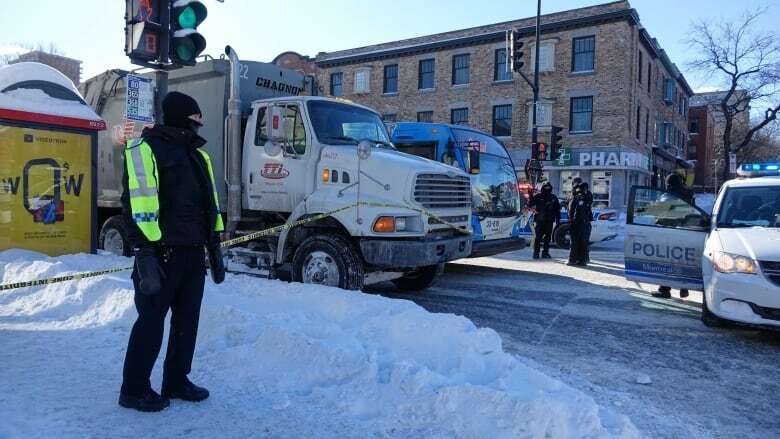 Montreal's first pedestrian death of 2019 occurred just three weeks into the new year when a 79-year-old woman was struck and killed Tuesday by a turning garbage truck. The victim wasn't jaywalking or even crossing the road. She was on Parc Avenue's sidewalk near St-Joseph Boulevard. The incident was all-too familiar to nearby resident Aaron Zak who witnessed a fatal collision between a car and cyclist on Parc in 2016. "There are a lot of blind corners," he said. "There are a lot of kids that are on scooters or old people that can't move out of the way quickly." That perilous blend is exacerbated by impatient drivers and trucks zipping down narrow side streets and busy boulevards, he said. Tuesday's fatal collision comes on the heels of 2018's five-year high of pedestrian deaths, with 70 per cent of those killed over 55 years old. Half were over 65. Every year, many of the pedestrians killed in Montreal fall victim to the blind spots of turning trucks and this week's death is no different. "Unfortunately it's another situation where a large truck is involved in killing a pedestrian or a cyclist," Alain Deschamps told CBC Montreal's Daybreak Wednesday. "At this point, it's something that's been going on for many years and, quite frankly, I'm kind of at a loss for words as to why there's been no action to prevent further deaths like this." Deschamps is a member of the safety advocacy group Ghost Bikes Montreal — an organization that places white bicycles at the scene of fatal collisions between cyclists and vehicles. A white bike is already leaning against a tree not far from where Tuesday's fatal collision took place, marking the spot where another cyclist was killed in 2013. Plateau-Mont-Royal Mayor Luc Ferrandez told reporters Tuesday that officials will examine the busy intersection closely to see if something can be done to improve safety. However, Deschamps said officials should also be looking at the dangers of trucks as blind spots are so often the root cause of fatal collisions. The city, he said, should be following London's example. In the coming years, thousands of trucks with poor visibility will be banned from London's streets to protect cyclists and pedestrians in a city that, like Montreal, has plenty of ghost bike memorials. In London, trucks will be rated based on the driver's ability to see pedestrians and cyclists. Those with a low rating will be prohibited from driving on the city's streets. Deschamps said his group has been pushing Montreal to adopt a similar measure, but that it would take years to implement. Last year, the executive committee said it was impressed with London's measures and was looking into the possibility of adopting a similar tactic. In the meantime, drivers need to be better educated about the dangers of vehicles, said Deschamps. It's inappropriate to put the emphasis on educating pedestrians and cyclists, he said, noting that's been the common practice for years. Tuesday's death is an example of somebody completely innocent of wrongdoing being killed by a vehicle not properly designed for navigating pedestrian-packed city streets. "This woman was doing everything right," he said. "She was on the sidewalk. She has every right to expect to be taken care of and not killed for going about her daily business." Parc is a busy, multi-lane road and the design of such streets tends to be focused on the fluidity of traffic rather than the safety of pedestrians and cyclists, he said. He says more needs to be done to protect non-motorists. "We had 15 pedestrian deaths last year," he said. "I don't know how any city or any society can look at itself and think that that's an acceptable result."